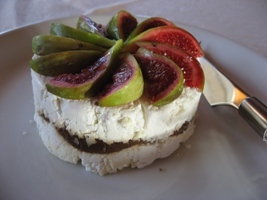 The food of the Cahors is typical of Central France, being hearty and generous and making full use of the great variety of local produce farmed and grown here. Good soups, garlic, walnut oil, truffles, wild mushrooms and chestnuts and an abundance of vegetables form the basis of many dishes together with goose, duck and chicken fed on maize and corn, and lamb roasts and casseroles.French farmhouse cooking is a speciality of the Cahors region with the cuisine based on local tradition and local products. When eating our be sure to try the local foie gras dishes such as Foie gras mi-cuit et confit de figue maison or Foie gras poélé or enjoy it in the regional speciality, Salade Quercynoise, a dish that embraces smoked duck breasts, goose livers and gizzards, with a foie gras sauce and crisp lettuce. A must try is the local charcuterie - the air-dried sausages and hams. Enjoy Saucisson sec de chevreuil , air-dried salami of venison. 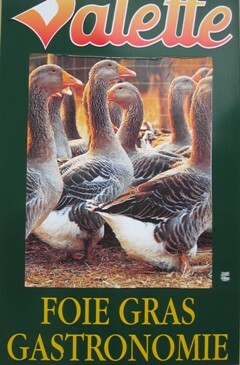 Goose confit appears in dishes such as Cassoulet au confit de canard et de saucisse de Toulouse. While beef stews such Daube de boeuf bring together aromas of beef, wine, herbs, pork and the fragrance of oranges. 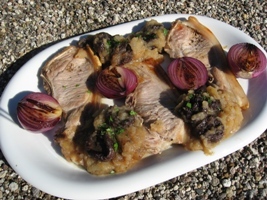 Chicken is an important feature of Cahors cooking with traditional dishes such as Poulet Chasseur and Coq au vin with that blend of chicken, herbs and wine. 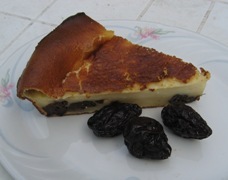 Dessert lovers are well catered for with French batter-styled dishes of clafoutis aux cerises , luscious cherries baked in egg batter and served with cream. 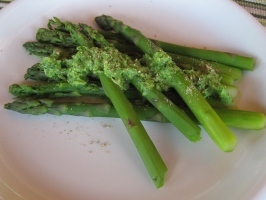 Plump green-stalked asparagus with a vinaigrette of vinegar, olive oil, chives, shallots and a dash of anisette liqueur - a seasonal delight. 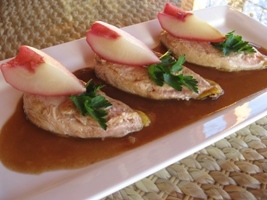 A combination of foie gras and tangy apples with a balsamic vinegar and meat stock sauce. 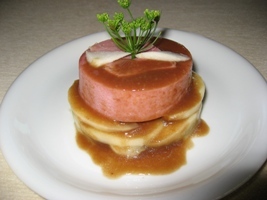 A great starter course or luncheon dish. 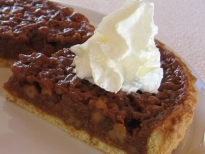 A very typical dessert from the central region of France with delightful tastes of walnut and honey. Put the sugar into a fairly large saucepan. Place over high heat and stir from time to time till it caramelises. 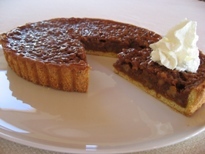 Cook until a brown caramel has formed. Off the heat, stir in the cream and honey to make a smooth mixture. Add the chopped walnut kernels. Line a 250mm loose-bottom flan dish with the pastry. Prick base and blind bake at 180ºC for 10 minutes. Pour on the filling. 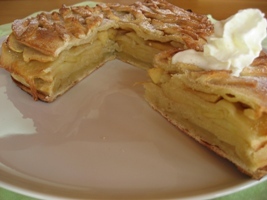 Bake tart at 180 degrees for 20 minutes, remove from oven and allow to stand for 5 minutes. Release sides, Push up and remove metal base. Place on serving plate. Serve warm either plain or with crea m or ice cream. 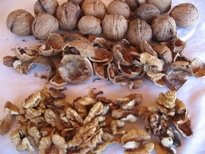 Use the best fresh walnuts. The secret is to caramelise the sugar - not burn it!